The Music Ministry of the Manchester First United Methodist Church strives to meet the needs of every age level. Your participation is very important to us, and we encourage you to give your time and talent to this vital ministry of our Lord and Savior, Jesus Christ. The Chancel Choir is open to all who want to share their talent in song. We sing at all 11:00 A.M. services as well as special events throughout the year. 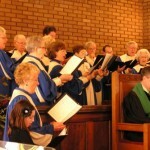 Other ensembles and soloists are used to support the vocal musical offerings in the worship services. 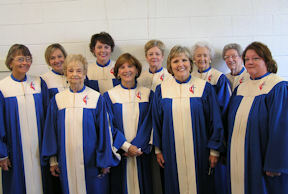 The Chancel Choir sings a variety of musical styles from Classical, Liturgical, Gospel and Contemporary. Rehearsal is held on Sunday after the 11:00 Worship Service. Cantata Choir is open to all choir members, church members and members of the community. Preparation for the Christmas Cantata begins in September with rehearsals on Sunday afternoon. Please call or email the church (706-846-3213 or office@manchesterfirstumc.org) for more specific information regarding practice times. Handbell Choir is open to all who read music and wish to ring handbells and hand chimes. Practice is on Wednesday at 7:00 P.M.. A weekly commitment is required. This choir performs in morning worship approximately once a month. Youth Music is made up of all interested youth. 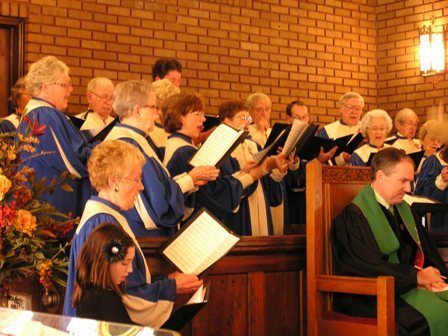 This group sings a variety of music from contemporary Christian literature and sings during services and special events several times during the year. Rehearsals are during youth meeting times at 6:30 Wednesday evenings. Children’s Music is open to all children who attend Children’s activities on Wednesday evenings from 6:30-7:30. These children sing at the 11:00 worship service 2-4 times per year. Also, the children have a part in the Christmas Cantata in December.